When the nerve (pulp) of a tooth is inflamed, infected or non-vital, early intervention can prevent the tooth from needing to be extracted. Our Menai family dentist provides gentle root canal treatments for situations such as these. After all, it’s always best to preserve your natural teeth if at all possible. If left untreated, these infections can cause the tooth to fall out, as well as infect the gums and bone surrounding the teeth. 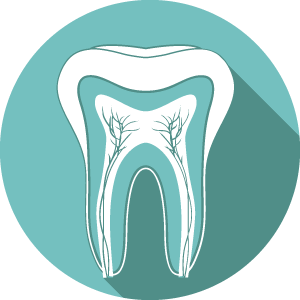 Treating it quickly can help you retain your natural tooth for years to come. We do this by performing a root canal to remove the infected nerve. First, Dr Stephen Suster (Dentist) will order an X-ray of the tooth to assess the health of the nerve. If it is infected, the area around it will be numbed and an opening made through the top of the tooth. Next, the nerve tissues and any decay are completely removed, and the tooth is cleaned and medicated. A special filling material is used to seal the canal and prevent reinfection. At Vision Dental, we use rotary nitanium instruments to more thoroughly clean the canals with less risk of fracture. In most cases, we recommend placing a crown over your tooth after the root canal. This ensures maximum integrity for normal daily use. Otherwise, the brittle enamel could wear or chip prematurely. Root canal treatments usually require 2 or 3 appointments to complete. Rest assured, our Menai dentist will keep you as comfortable as possible throughout the process! Vision Dental also offers sleep dentistry to help you relax throughout the process. If you suspect that you may need a root canal, contact us today to schedule an evaluation. Be sure to ask about our 0% interest free financing options.